Seattle, Wash. - A team of University of California, Berkeley, astronomers announced today (Thursday, Jan. 9) that its robotic telescope has captured one of the earliest images ever of the visible afterglow of a gamma-ray burst. KAIT's first image of GRB 021211, beginning at t=108 seconds after the gamma-ray burst. 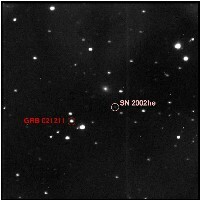 The field of the GRB is superimposed upon the field of the supernova SN 2002he (a different part of the sky), because KAIT had been observing SN 2002he when the GRB alert arrived. The GRB is at magnitude 14.8. The Dec. 11, 2002, burst captured by KAIT was also seen by RAPTOR (RAPid Telescopes for Optical Response), operated by Los Alamos National Laboratory, about 65 seconds after the network alert from HETE-2, making it the second earliest detection ever. RAPTOR, however, obtained only one exposure of the afterglow, so KAIT's continuing observations beginning 43 seconds later provide unparalleled coverage of the initial fading of the afterglow. The Super-LOTIS telescope at Kitt Peak in Arizona also captured some images automatically, starting 143 seconds after the burst.